This is a guest post by Anglo-Italian journalist Lorenza Bacino, about her trip to the beautiful town of Cefalù, Sicily, one of my favourite places in Italy. 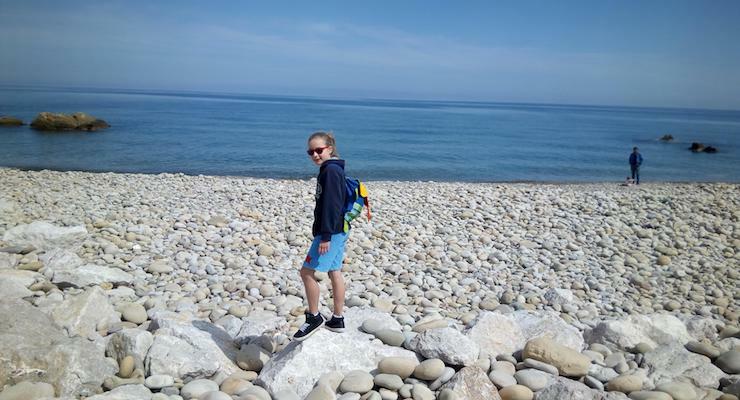 ‘My family and I (husband, two children aged 11 and 14) were fortunate enough to enjoy a week-long spring break in Cefalù, a charming town on the north coast of Sicily about one hour’s drive from Palermo. We thoroughly enjoyed exploring its cobbled streets, eating delicious ‘arancini di riso’ (rice balls stuffed with meat and mozzarella) and sweet ricotta pastries. Cefalù is also a gateway to the Madonie National Park, 161 square kilometres of protected nature reserve and home to dozens of medieval villages and some of the island’s highest peaks. Here are a few of the things which we found to see and do. 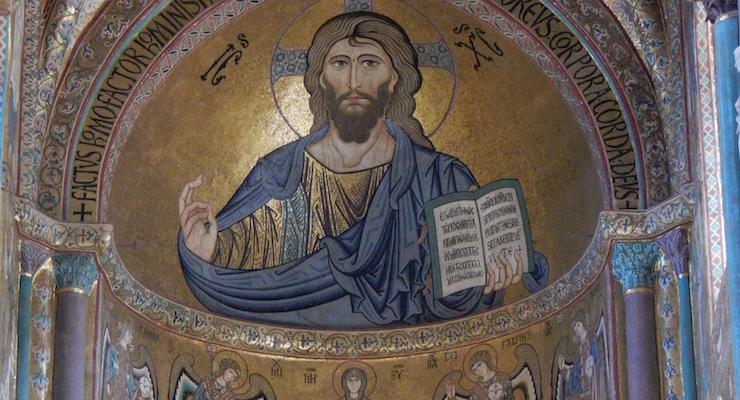 The main square in Cefalù has a beautiful twelfth century duomo housing an impressive byzantine mosaic of Christ in the apse and two Norman towers on each side of the facade. There are a number of cafes around the piazza serving traditional Sicilian cakes and ice creams. These are very delicious and I recommend asking about the different types of sweet ricotta pastries. There’s a dizzying array to choose from. My daughter became instantly addicted to ‘arancini’ and decided to live on these for the rest of the week. Springtime is an ideal time to visit, as the weather is sunny but not too hot and therefore perfect for climbing the ‘Rocca di Cefalù (the Rock of Cefalù) where you can enjoy sweeping views across the Tyrrhenian Sea without dying from heatstroke. (Locals said that temperatures in summer can reach a staggering 40+ degrees). The Temple of Diana is at the top and there’s also a small archaeological site to explore on the way down. It’s quite a steep climb, though not especially hard. Expect it to take about 40 minutes to reach the top. The children scampered ahead across the rocks like goats – of which there are a few up there bleating away in the breeze. The Museo Mandralisca is a gem of a private museum. It was founded by Baron Enrico di Mandralisca in the nineteenth century and is where you can see Cefalùs renowned Rennaissance painting by Antonello da Messina, Portrait of an Unknown Man, 1465. It’s sometimes compared to Leonardo’s Mona Lisa, but without the hype. The museum houses a collection of archaeological relics and stuffed animals, and the library and tiled floor are particularly beautiful. When exploring the town itself, do go off the beaten track down the small alleyways. You’ll find quaint buildings and even access a small beach via an archway where you can enjoy a different perspective on Cefalù. The Fiumara d’arte sculpture park and hotel, about 40 minutes drive from Cefalù towards Messina, was a truly astonishing find and an incredible experience – a highlight of our visit. In Castel di Tusa we visited the Art Hotel, (Atelier sul Mare), a unique and inhabitable work of art. There are 40 rooms, 24 of which have been turned into works of art by various international artists and you can immerse yourself in ideas whilst staying in a room of your choice. A guided tour of the hotel takes about an hour. You should experience this as what you find behind each door is a journey in itself. The project is ongoing with the goal of transforming all 40 rooms in the Atelier into inhabitable works of art. Enjoy a bite at the idyllically located Le Lampare restaurant – a terrace overlooking the beach a stone’s throw from the Atelier sul Mare – before taking a tour through Europe’s biggest open-air sculpture museum to seek out the works dotted about the hillsides (there are maps available from the hotel). There are ten enormous sculptures within a 50 km radius, so you could spend a whole day tracking them down. Local artist Antonio Presti came up with the idea for this extraordinary park and hotel about 25 years ago, following the death of his father. We found the enormous steel Pyramid at Motta d’Affermo, which has been constructed exactly on the 38th parallel. 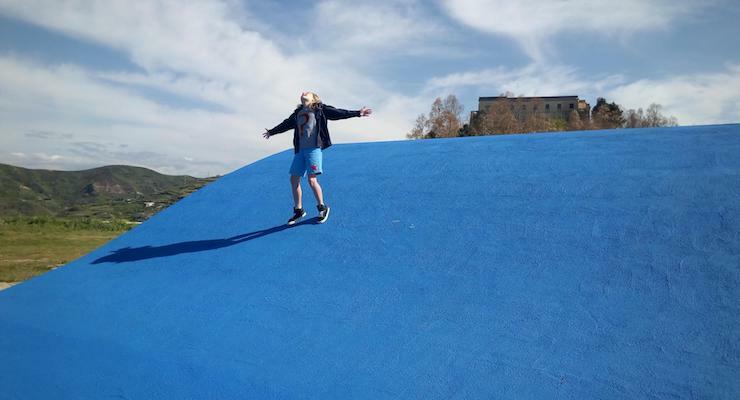 We enjoyed climbing ‘Energia Mediterranea’, a huge bright blue concrete wave on a grassy verge. My daughter enjoyed a morning cooking with local artist and chef, Nino Quartana. He lives in a striking modern house in the hills just above Cefalù surrounded by an organic ‘synergetic’ garden. Having spent a decade in the Philippines, Nino’s home is infused with eastern influence as is his cooking. 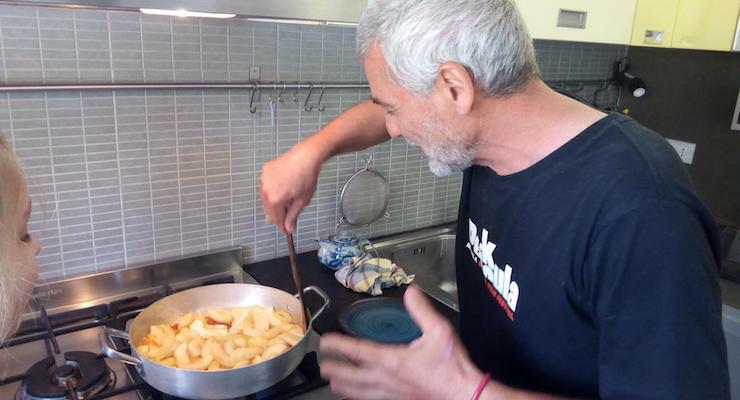 He and my daughter made a delicious upsidedown apple cake with ingredients collected from the garden – green apples which she caramelised in Nino’s homemade orange marmalade. Even the flowers were edible, and nothing gets wasted, says Nino. His cupboards are rammed with jars of herb and spice infusions – ‘I’m a bit of an alchemist’ he jokes. Along with the cake, my daughter also learned a simple pasta dish – spaghetti with aglio, olio and peperoncino (garlic, olive oil and chilli) all of which we ate heartily, whilst chatting with Nino in his garden. Nino cooks from the heart and fuses art and design with cooking. He’ll gladly come to your villa to cook for you and your friends or better still, do it together with him as he has many handy cooking tips to share. We couldn’t believe that there would such a significant place of research in such a remote area. 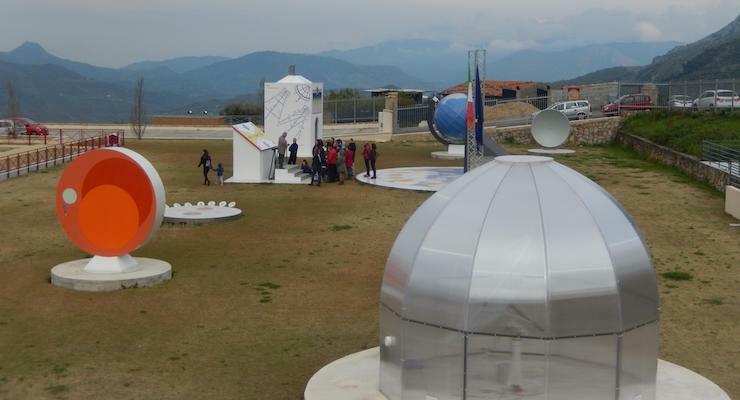 Yet, above the tiny picturesque village of Isnello, you’ll find the international Centro Internazionale per le Scienze Astronomiche – or Gal Hassin International Astronomy Centre, just like a mini-Greenwich. My son and I enjoyed a guided tour of the surrounding park where you’ll see sundials of varying shapes and sizes. There’s a 10-metre diameter planetarium replete with 12 telescopes on the observation terrace and an interactive multi-media exhibition space. You need to book ahead if you’d like to visit the centre. Other villages we visited within the Madonie Park include Castelbuono, a quaint medieval village where you can eat the best panettone ever. It’s light and fluffy and utterly divine. Varieties are handed out in the main square and in the nearby Fiasconara shop you can choose a favourite to buy and take home. The family has been making their delicious recipes since the 1950s when Mario Fiasconara began with just a small ice-cream parlour in the village. By the 1990s the Fiasconara brand had become international and continues to grow to this day. Gratteri, at 1400 metres above sea level, is not at all touristy. It’s a place where women in black still sit in the streets outside their houses. It has a rather desolate feel about it, as though most of the inhabitants have left to seek their fortune elsewhere – which they have – as we found out from the locals. Only 900 inhabitants remain out of an original 3000 or so. It enjoys spectacular views over the Madonie Park. In Cefalù try Al Porticciolo (Via Carlo Ortolani di Bordonaro, 66 and 86/90 tel +39 0921 921981 or 0921 423151). The décor is lovely and you get a free glass of bubbly at the start of your meal. Also in Cefalù, MANinPASTA, (Via Matteotti, 45, tel +39 0921 421197) has quick service in a family-friendly environment, and very good food. In the small village of Sant’Ambrogio, near Cefalù, Osteria Bacchus (or Da Ciccio to the locals) makes for a fantastic experience. It’s tiny, and Ciccio cooks seasonal local produce so the menu changes daily and in our case consisted of artichokes in various forms and giant prawns. (Osteria Bacchus, Belvedere di Sant’Ambrogio, 2 or call +39 320 1449452). 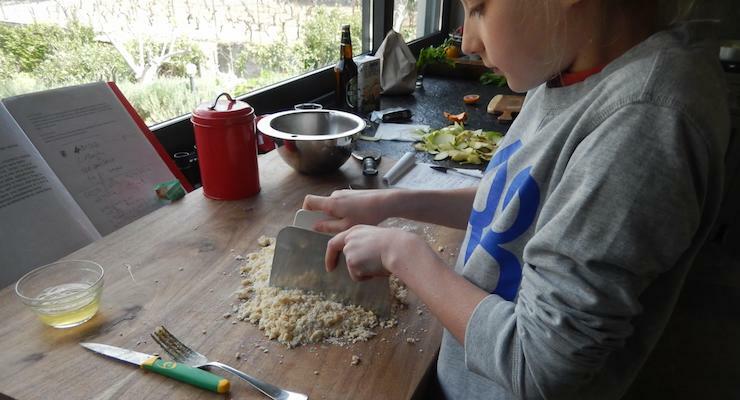 Ciccio also organises cookery courses. In Castelbuono try the Nangalarruni (Via delle Confraternite, 7). It has 600 different wines and specialises in wild mushrooms and local cheeses. Il Palazzaccio (Via Umberto I, 23) has a chic interior and a stone vaulted ceiling (both of these restaurants are recommended by Nino Quartana). In Castel di Tusa try the terrace overlooking the beach at Le Lampare (via Cesare Battisti, 41/43 tel +39 0921 334294), which offers excellent fresh seafood and pizzas. 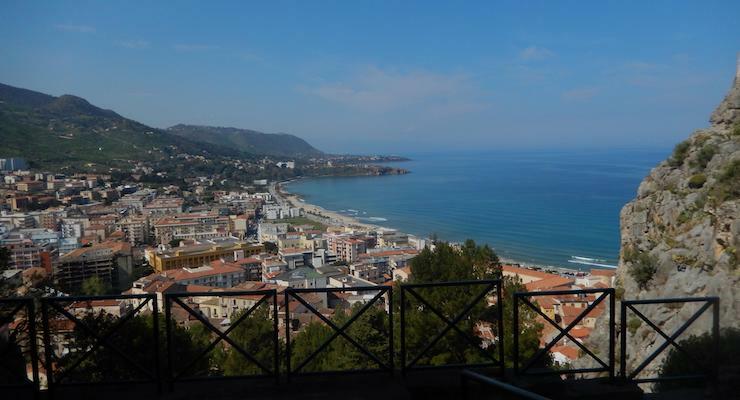 Lorenza and her family enjoyed staying in a villa (see her review), but if you’re looking for a great hotel in Cefalu I’d definitely recommend Hotel Kalura, where I’ve stayed with my family several times. 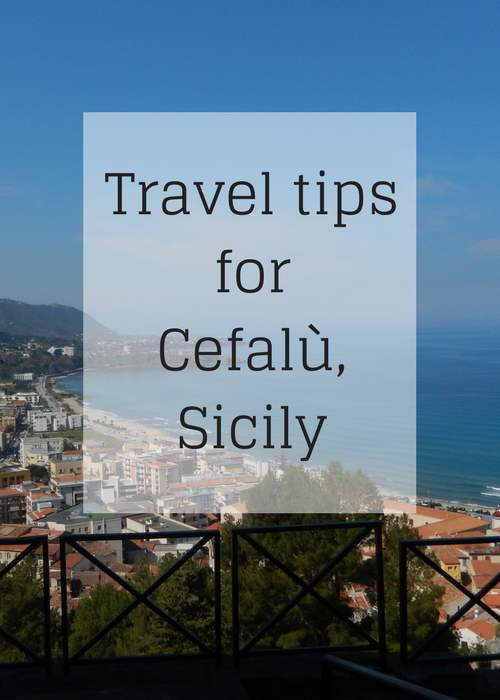 If you’ve been to Cefalù, do you have any tips to add? If you haven’t been, would you like to go there? Disclosure: Massimovillas provided the accommodation for Lorenza and her family for this trip. Massimovillas offer villas sleeping up to 12 people in Sicily, Puglia, Tuscany, Sardinia, the Veneto and Formentera. All of the villas have private pools or are near the coast. Yes I’d love to go there. So many interesting places to visit and the food descriptions are making my mouth water! Hi there, I’m French and I have been living in Castelbuono near Cefalù for several years. Now I have a 3-year-old French-Sicilian little boy and I can confirm that Cefalù and all the Madonie area are a great place for holidays with children, not only for sea and nature, but also because local people are really very kind. I suggest to include in a family stay here a hike (an easy one) in the Madonie Mountains or a walk with a donkey organized by the association I deal with: Nature Explorers Sicily. Thanks for the tip Laetitia!